Thames sailing barges are one of the most remarkable and prolific sailing ships of Europe. They evolved in the 17th and 18th centuries from small coastal craft and the lighters used to unload ships in the Thames. Today there are about 50 Thames Sailing barges in various states of repair left from the two thousand that were registered in 1900. Of those survivors there are only 28 rigged and in regular sailing order. Unique in being handled by two or three men, the flat bottomed barge could sail up narrow shallow creeks making her ideal for the East Coast. But they also voyaged all over Europe, to Sweden, Norway, Germany, Holland, Belgium, France and Spain and even to South America. Cargoes included: grain, coal, sand, mud, beer, pineapples, stone, timber, straw, munitions, animal foodstuffs, fertiliser and cement. We know that in her time Wyvenhoe traded to Newcastle, Hull, London, Ipswich, Rochester, Maidstone, Calais, and Dunkirk. From 1898 to 1982 she earned her living as a cargo carrying ship. Converted to a motor coaster in 1923, she was the last former sailing barge to carry cargo commercially. 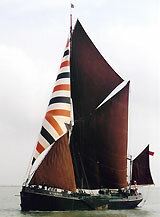 In 1983-84 she was re-rigged to sail and used for entertaining corporate clients by a major paint company. With the below deck area converted to accommodation, she then became a largely static base for corporate training and entertainment in London. Since 2003 she has sailed actively carrying charter groups and taking part in annual barge matches while undergoing a program of continuing restoration and improvement. In 2011 Wyvenhoe was featured in an edition of the BBC programme Countryfile when she took part in an impromptu 'race' with another barge in the River Medway and presenter Matt Baker interviewed Wyvenhoe's Skipper Martin Phillips (See Photo Gallery).